To support a noble cause - raise awareness for breast cancer - Fiat announced a special limited-edition model, the Fiat 500 Pink Ribbon. The production is limited to only 250 cars and Fiat will donate $1,000 per sale to the Breast Cancer Research Foundation. 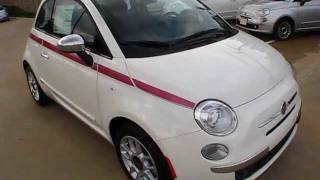 September 27, 2011 ,Auburn Hills, Mich.-	The FIAT Brand isexcited to announce the introduction of the 2012 Fiat 500 “Pink Ribbon” limited-edition model. Produced in partnership with The Breast Cancer Research Foundation®(BCRF), the collaboration allows breast cancer awareness advocates to express their support for the cause in modern iconic Italian style. Through the partnership, 250 Fiat 500 Pink Ribbon limited-edition vehicles will be available at FIAT Studios in October. Through the sales of the Fiat 500 Pink Ribbon model, FIAT will donate $1,000 per purchase, with a minimum of $50,000 contribution to BCRF. BCRF is dedicated to preventing breast cancer and finding a cure in our lifetime by funding clinical and translational research worldwide. Designed exclusively for FIAT Brand’s partnership with BCRF, the new 2012 Fiat 500 Pink Ribbon limited-edition model features several exclusive design elements that highlight the Cinquecento’s iconic silhouette. 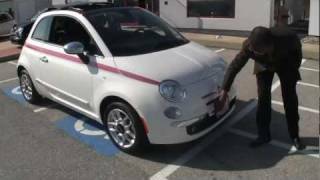 Based on the highly stylized 2012 Fiat 500 Lounge model, the Pink Ribbon limited-edition is available in Argento (silver) and Bianco (white) exterior paint colors and features a signature dark pink bodyside stripe with “500” logo and an accenting “ribbon” in light pink. The interior of the Fiat 500 Pink Ribbon adds to the 500 Lounge model’s already stylish interior with unique pink accents contrasting the Nero (black) interior. Highlighting this limited-edition model are Nero leather front and rear seats with pink accent stitching on the perimeter and signature “500” logo embroidered on the front seatbacks and a pink ribbon embroidered on the floor mats. For added detail, pink accents are hand-stitched through the Nero leather steering wheel and provide additional contrast in front of the body-color instrument panel bezel. And to match this specially appointed Cinquecento, a pair of uniquely designed Fiat 500 Pink Ribbon key fobs provide customers with a personal reminder of the FIAT Brand and BCRF’s partnership to find a cure. 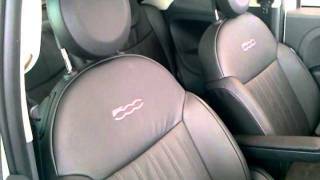 The 2012 Fiat 500 offers a multitude of safety features, fuel efficiency, world-class quality and advanced technology. With its city-friendly four-passenger size, engaging driving dynamics, all-new fuel-efficient 1.4-liter MultiAir®engine with eco:Drive™ Application, state-of-the-art TomTom®Navigation with BLUE&ME™ Handsfree Communication technology and seven standard air bags, the new Fiat 500 offers a unique driving and ownership experience. This package is further enhanced with new quality and refinement adaptations for the U.S. market, including an all-new six-speed automatic transmission. The Breast Cancer Research Foundation was founded in 1993 by Evelyn H. Lauder as an independent, not-for-profit organization dedicated to funding innovative clinical and translational research. In October 2011, BCRF will award $36.5 million to 186 scientists across the United States, Canada, Latin America, Europe, the Middle East, Australia and China. Currently, more than 90 cents of every dollar donated is directed to breast cancer research and awareness programs. With exceptionally low administrative costs, BCRF continues to be one of the most efficient organizations in the country and is designated an “A+” charity by The American Institute of Philanthropy, the only cancer organization to achieve this.